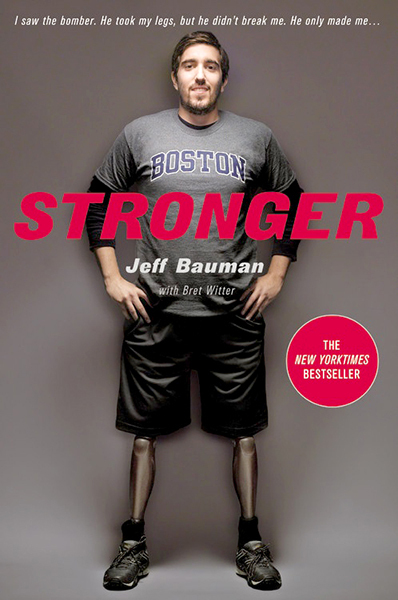 I recently had the pleasure of interviewing Jeff Bauman about his book, Stronger. My feature article can be found here. As the world learned of the Boston Marathon bombing on April 15, 2013, a photo of Chelmsford native Jeff Bauman went viral. The graphic image—showing the 27-year-old in a wheelchair after the loss of his legs—served to document the day’s incomprehensible violence and the heroism of those who rushed in to help. Two years later, Bauman presents a different image—a resilient 29 year old, married and with an infant daughter, a public speaker, community volunteer and author of the New York Times and National bestseller, Stronger, written with Bret Witter and released last year. He is also walking. “I know exactly when my life changed: when I looked into the face of Tamerlan Tsarnaev. It was 2:48 p.m. on April 15, 2013—one minute before the most high-profile terrorist event on United States soil since September 11–—and he was standing right next to me,” writes Bauman. Before that day Bauman was a regular guy trying to figure out his life: spending time with his girlfriend, family and friends, working at Costco, following his beloved Boston sports teams and trying to navigate student loans to return to college. “I never thought I would work on something like this,” he says of the book, which has a paperback release date of May 19. Bauman was at his first marathon to cheer on his wife then girlfriend, Erin Hurley, when the bomb exploded. Despite his injuries, he never lost consciousness, vividly recounting the events from before and after the attack. Initially Bauman tried to tell the EMTs helping him what he had seen. It was not until he woke up from his second surgery 30 hours later that he was able to communicate that he had seen the bomber—writing a note that his family passed on to an FBI liaison. Working with an FBI sketch artist for two hours after his third surgery, Bauman would ultimately put a face on one of the two bombers—Tamerlan Tsarnaev, who would die in a gunfight with Watertown police several days later. His description is believed to have been crucial to identifying the brothers. Being a public figure was never on Bauman’s radar. In the following days and weeks, his family tried to manage dozens of interview requests from news and television personalities and deal with reporters sneaking around the hospital trying to get information on “the man in the photo.” He was also meeting sports heroes and movie stars from his hospital bed. Bauman’s friend Katlyn (Kat) Townsend stepped in to lend her experience in public relations to the family. “She’s my buffer between stuff,” he says. “She’s a good friend and helps me a lot.” With so much attention, Townsend suggested he take control of his story and write a book, putting him in touch with an agency in New York City. A meeting was then arranged with bestselling author Bret Witter. In support of the book, Bauman tells his story to audiences around the country, recently speaking in Concord for the Concord-Carlisle Community Chest. He has also presented at a number of schools. Hesitant to tell his story to a young audience, Bauman has since learned that kids want to hear everything and are full of questions. Bauman uses his wheelchair when at home, but is fully mobile on prosthetic legs when traveling. “It’s very tiring, but I’m good. I can go on trips and walk through huge airports. I’m tired, but it’s starting to be my new normal.” Thanks to a donation by the manufacturer, Bauman is walking on Genium legs at a cost of $200,000. “The legs are amazing. 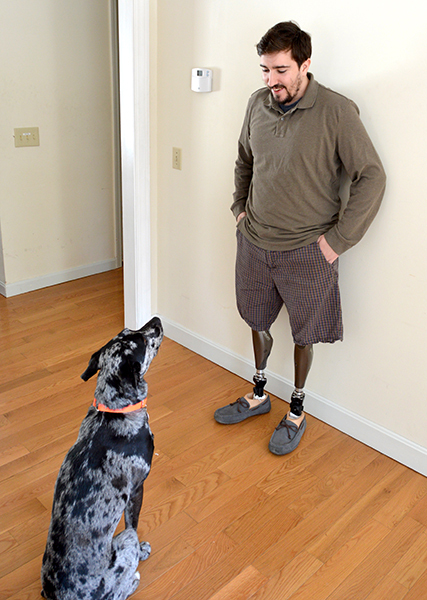 The knees are amazing,” he says, explaining that the only issue has been the fit of the sockets, which he travels to have adjusted at Prosthetic and Orthotic Associates (POA) in Orlando, Florida. Bauman has also returned to driving, resuming a year after the bombing and without any modifications to his car. He has even been pulled over for speeding a few times. “It was in my town—Chelmsford—so they were easy on me,” he laughs. “I love all the guys over there.” Bauman recently volunteered with the Carlisle Meals on Wheels program. The penalty phase in the trial of Dzhokhar Tsarnaev is slated to begin on April 21, but Bauman does not have a strong opinion about the death penalty, believing the lives of both brothers ended that night in Watertown. What ultimately follows is just noise. Last summer Bauman traveled to Los Angeles with some of the producers of the film The Fighter to pitch the story as chronicled in his book. Variety reports that Lionsgate Entertainment acquired the options and has launched development.